If you ever frequent the streets of downtown Cleveland, particularly in the entertainment districts of E. 4th Street and Playhouse Square, you most likely have seen this gentleman. I have seen and listened to him on at least a half-dozen occasions and because I find the saxophone a very soulful instrument, I think of him as the “Soul of Cleveland.” On the night I took this photo, I promised him a copy and now I have been trying to catch up with him again to give him a print. I have seen him a few times since but have not had the print with me and will now just keep the print in my car hoping to find him on one of my trips downtown. When I do, I’m going to ask to interview him to find out more about him. More to follow on “the Soul of Cleveland,” I hope! 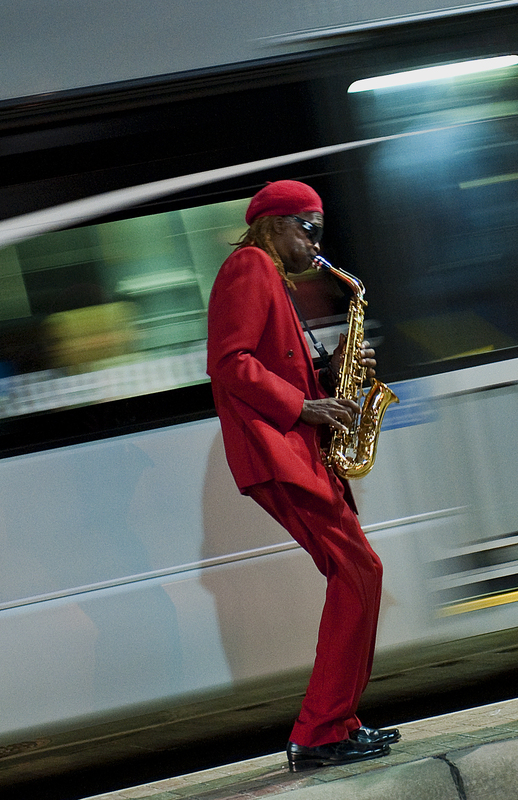 This entry was posted in Uncategorized and tagged bus, Cleveland, euclid ave., jazz, ohio, rapid transit, saxaphone, street musician. Bookmark the permalink. Is that Maurice Reedus, Jr.? His dad was a fairly well-known blues saxophonist, and I know the son often plays (“buskers,” is the actual verb) downtown quite a bit. As a saxophonist myself, I love to stop and listen whenever I come across him. Hi Scott, I don’t know his name but wanted to find out and possibly interview him. So thanks, that’s probably who he is. I’ve also seen him numerous times at different locations, always very neatly dressed and a great performer! I’ll let you know when and if I find him and talk to him. and you are correct, that is definitely him, same suit, a beret, though a different color. Great! I kind of figured that must have been him. Glad to have helped.